By Sinha, Kounteya LONDON: Scientists have found that getting even a little bit of sun benefits health tremendously and prolongs life. Exposing skin to sunlight helps to reduce blood pressure and cut the risk of heart attack and stroke. Researchers from the University of Edinburgh have shown that when our skin is exposed to the sun's rays, a compound is released in our blood vessels that helps lower blood pressure. The findings suggest that exposure to sunlight improves overall health, because the benefits of reducing blood pressure far outweigh the risk of developing skin cancer. Heart disease and stroke linked to high blood pressure are estimated to lead to around 80 times more deaths than those from skin cancer, in the UK. Production of this pressure-reducing compound--nitric oxide--is separate from the body's manufacture of vitamin D, which rises after exposure to sunshine. Until now it had been thought to solely explain the sun's benefit to human health, the scientists add. Researchers studied the BP of 24 volunteers who sat beneath tanning lamps for two sessions of 20 minutes each. In one session, the volunteers were exposed to both the UV rays and the heat of the lamps. In the other, the UV rays were blocked so that only the heat of the lamps affected the skin. The results showed that BP dropped significantly for one hour following exposure to UV rays, but not after the heat-only sessions. 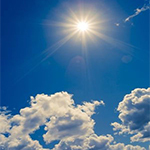 Scientists say that this shows that it is the sun's UV rays that lead to health benefits. The volunteers' vitamin D levels remained unaffected in both sessions. The landmark proof-of-principle study will be presented on Friday in Edinburgh at the world's largest gathering of skin experts. Dr Richard Weller from the University said: "We suspect that the benefits to heart health of sunlight will outweigh the risk of skin cancer. The work we have done provides a mechanism that might account for this, and also explain why dietary vitamin D supplements alone will not be able to compensate for lack of sunlight." "We now plan to look at the relative risks of heart disease and skin cancer in people who have received different amounts of sun exposure. If this confirms that sunlight reduces the death rate from all causes, we will need to reconsider our advice on sun exposure," Dr Weller added. Editor's note: Health experts still advise caution and to practice sensible sun exposure to reduce the risk of skin cancer. Excessive sun exposure can increase the risk of skin cancer.